What is black and white and soon to be read all over Canada? I couldn’t help but think of this riddle when the fourth edition of Employee Benefits in Canada was delivered to my desk a few days ago. The text is black and white while the cover is bright red. And true to my fine-tuning of the riddle, benefits professionals all over Canada will soon be reading it. Now available for purchase in the International Foundation bookstore, the book has more than 600 pages with 61 chapters written by 37 Canadian benefits experts. It covers a multitude of topics organized into ten sections. There is also a 35-page glossary with definitions of key benefit terms used in Canada. 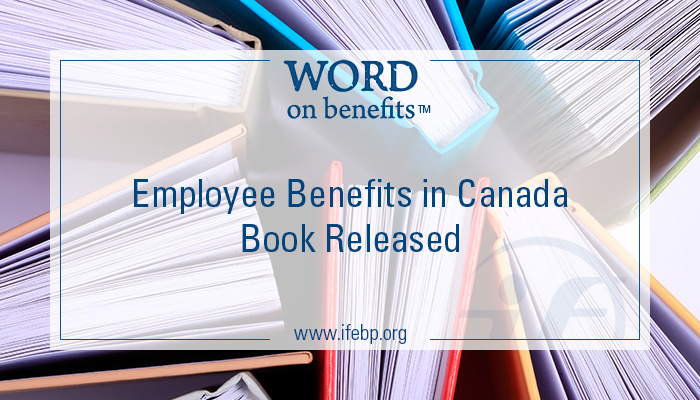 One of the most popular books ever published by the International Foundation, Employee Benefits in Canada was first published in 1991. That initial edition was a mere 324 pages in length. In many ways, the near doubling of the page count reflects the many changes and increasing complexity of Canada’s pension and benefits industry over the past 25 years. Special thanks to the editors who were so committed to updating this resource: Mark Zigler, Murray Gold, Michael Mazzuca and Roberto Tomassini from Koskie Minsky LLP and D. Cameron Hunter from Eckler Ltd.